Longstanding plans to redecorate the chancel of the medieval cathedral of Ribe finally came to fruition in 1982 when the decision was taken to commission Carl-Henning Pedersen (1913-2007), one of Denmark’s leading modern artists, to take on the enormous task. The church authorities had to hold firm because from the start their decision aroused controversy. Opposition came from those who felt that modernist art and medieval church architecture did not mix. Even more vehement were those who held that a non-believing artist was unsuited for work on a cathedral. ‘I am not a religious man,’ Pedersen is reported as saying. In fact, he had the reputation of belonging to movements that in some respects had actively sought to secularise modern art and culture. What, then, could this artist have contributed to Ribe Cathedral without compromising the building’s Christian heritage, or, for that matter, his own position as a non-believer? It is useful to look first at Pedersen’s early years. Along with artists such as Asger Jorn and Egill Jacobsen, Pedersen and his first wife Else Alfelt were associated in the 1930s and 1940s with Danish groups that combined Marxist politics with a ‘spontaneous abstraction’ in painting. After 1945, Jorn travelled widely and acquainted other young artists with these Danish developments. Out of these contacts grew the international Cobra movement (1948-1951), through which the Dutch artists Karel Appel, Constant and Corneille visited Copenhagen and saw for themselves the ‘spontaneous’ Danish paintings. Pedersen and Alfelt, for their part, came to Amsterdam for the major Cobra exhibition at the Stedelijk Museum in 1949. The labels ‘Marxist’ and ‘revolutionary’ may have stuck to Cobra and its Danish antecedents, but it would be a mistake to assume that all these artists were therefore antagonistic to tradition and to religious art. Danish artists such as Pedersen and Jorn were unorthodox Marxists, dissatisfied with the reductionism of a materialist worldview. Their art was primitivist and vitalist and concerned with fantasy and symbol. It drew freely on folk art, medieval art, tribal art and child art and stood in clear opposition to the socialist realism propagated by mid-century international communism, with its slavish portrayals of power stations and smiling soldiers. Pedersen was striving to paint universal life-symbols in a modern idiom and the sources he valued were often religious ones. In 1944 Pedersen published an article on frescoes in medieval Danish churches, expressing his kinship with a religious folk art that probably ultimately derived from ancient Byzantine iconography. His own style was characterised by dots of colour that gave a mosaic-like vibrancy to the painted surface and the fantasy figures in his paintings stare out at us like Byzantine saints. Pedersen and Alfelt travelled to Northern Italy and Greece in 1951, seeing Byzantine mosaics that deeply impressed them by their radiant colours. It is therefore scarcely surprising that the most impressive of Pedersen’s decorations in Ribe Cathedral are the seven large mosaics in the arches of the apse. 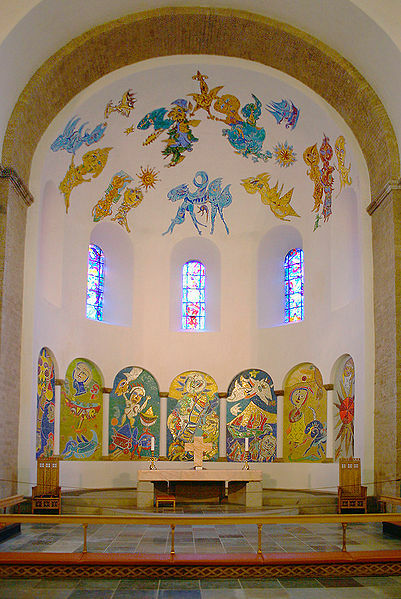 Above them are five coloured windows, to Pedersen’s design, and high in the vault he has painted frescoes of floating symbolic figures that recall the medieval ones he wrote about in 1944. Pedersen did not have to deny his own artistic style in order to make these decorations; he only had to raise it to a new, monumental scale. In terms of iconography – the subjects and titles were Pedersen’s own choice – his long experience in painting universal and elevating symbols allowed him to turn easily to themes that are either biblical or associated with church legend. Pedersen’s fantasy paintings often showed a strong sense of the sky/earth relationship and in his Ribe images we see an unmistakable preference for themes linking Heaven and earth, for example in the three mosaics directly behind the altar that represent Old Testament episodes. The central one depicts Jacob’s Dream, with its asymmetric ladder rising from the sleeping Jacob to the Heavenly region and the radiant face of God. To its right (our left) is a depiction of The Ascension of Elijah. Above his chariot of fire, the prophet, with his very Byzantine face, seems to be drawn upwards by a dove-like bird. In the mosaic on the other side of centre, titled After the Flood, the dove carrying an olive branch is now huge, its aerial presence dominating over the earthbound mountain, the ark and the sleeping, drunken Noah below. Here we can note Pedersen’s typically primitivistic or childlike mode of composition in which the size, colour and placement of figures is dictated by expressive intent and not by any naturalistic considerations. The windows maintain the thematic Heaven/earth relationship but because they are more abstract than the mosaics they invite us to experience their radiant colours rather than ‘read’ their iconography. The figures in the frescoed vault contain many references to early church symbols - such as a fish, a lamb’s head and the Virgin Mary in her blue gown – which can take time and insight to decipher. That the blue animal figure in the lower centre (directly above the altar) represents a unicorn - a fabulous beast that some sources link with the representation of Christ in medieval art, others with the chastity of Mary - was revealed by the artist’s second wife, Sidsel Ramson, in her book Like the Great Vault of Heaven which documents with many photographs and diary entries (Danish/English texts) the long process of Pedersen’s work at Ribe. Those who feared the intrusion of a modern artist in the ancient cathedral of Ribe need not have worried. Pedersen brought his own personal orientation to medieval church art to this commission and to my mind his techniques and style are thoroughly compatible with character and function of the historic building. Granted, not every church council would have allowed such free-ranging iconography. But in that respect Pedersen’s approach differs little from that of his medieval forebears. Whoever looks closely into the iconographic programmes of the great medieval cathedrals will usually find biblical reference woven together with all manner of symbol and legend. Carl-Henning Pedersen: Frescoes, mosaics and stained glass windows in the cathedral of Ribe, southern Jutland (Denmark), 1983-1987. Dr. Graham Birtwistle, who taught modern art history at the VU University in Amsterdam from 1971 to his retirement in 2004, has written extensively on the Cobra movement. His book Living Art (Reflex; Utrecht, 1986) dealt with the theories of the Danish Cobra-artist Asger Jorn in the later 1940s.